An auditorium of approximately 600 seats was not enough to house the crowd of people who flocked to the Saint Joseph University (USJ) campus today. What looked like 1000 people turned up for Carlos Ghosn’s conference on Renault and Nissan’s journey amidst the economic crisis. Due to the incompetance of the Lebanese public, the schedueled start time of 530 dragged to 545. Ghosn fans filled the aisles in discontent, hoping for a seat to appear beneath them. At 536, Ghosn appeared from behind the curtain and greeted his guests at the front row. The conference took place, to my dismay, in French. For that reason I focused on getting a question in at the end of his lecture, 55 minutes later. I have to say, he is an excellent public speaker. All audience members were asked to write down their questions on a piece of paper for Ghosn to answer. Unfortunately, he didn’t have time to answer them all, which made me want to rip off my ears. As I bullied my way through the crowd onto the long table of free food, I stuffed myself with tuna, cheese and Za’atar and as I picked my teeth, a large amount of people began to gather around an empty section of the hall. 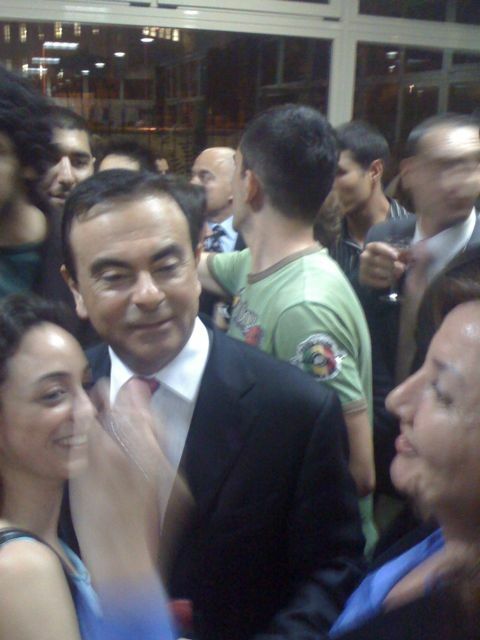 Ghosn had emerged to say hello and I managed to get my question through to him then. He replied. Apologies for the low quality photos. All I had was my iPhone 3G. “I have been asked this many times after 2008. We will continue to supply engines until the time comes when we can’t. What I want to see is zero emissions and with something like this sport, I don’t see it happening,” he ends negatively, in his very French English tone. Brief and not exactly what I was looking for. I hate answers that are not clear and to the point. Nevertheless, I was able to get something. Zero emissions is possible. The explosion of hybrids and EV’s and Hydrogen powered vehicles is proof that the technology will transfer into Formula 1. I’m just worried about that high pitched tone we love so dearly. Every transformation from gas to battery seems to lose its sound track and I can’t have that. Imagine watching Formula 1 on television…with the mute button pressed. That would be F1 a la EV and I would pass out almost immediately. For this year, the Renault F1 Team have an important sponsor by their side: Lada – a trademark to Russia’s largest automaker, AvtoVAZ. With the signing of Russian driver Vitaly Petrov, it seemed fitting that Lada sponsor the first Russian Formula 1 driver. Renault owns 25% of the company and aims at putting together a successful 2010 season.